During the 1996 season, the survey team accomplished two goals: (1) to continue the detailed survey of the Eumachia Building begun in 1995, and (2) to model a section of the Macellum for the study of the effects of seismic activities on the walls of the building. The workday was divided into two. The first was the morning survey work in the forum. The second was the afternoon CAD work back at the hotel. Survey work began at 8:00am. The crew divided the tasks for preparing the survey work as follows: one member--the machine operator--chose the optimal location for setup, mounted the total station, adjusted the level and connected the data recorder. The other member--the prism holder--examined the walls to be surveyed, drew the necessary sketches in the notebook, and planned the sequence of points to be surveyed. Then work began. The prism holder held the prism against a survey point. The machine operator aimed at the prism and fired. In seconds, the space coordinates of the point were stored in the data recorder. The prism holder marked the location of the point on the sketch. This process of aiming at and recording points was repeated a few hundred times until enough points to construct the wall on CAD were gathered. Work ended at about 1:00p.m. The crew packed the equipment and headed back to the hotel where one room doubled as a CAD work center. After lunch, the crew members worked on the construction of the CAD model. They examined the batteries of the survey equipment and charged them for the next day. Then, using laptop computers, they began building the model using the points gathered earlier in the day. The points were imported into the model file, and lines and surfaces were drawn to connect them. The notes taken earlier were closely followed during the building of the model. The day's work was complete when all points gathered in the day were used in the model. To give the reader a more elaborate account of the survey work, we will examine one specific day of work from the 1996 season. The wall surveyed on that day, the 20th of June, was wall W51.39, in the southeastern portion of the Macellum. Page 89 of the notebook contains an elevation sketch of that wall, with a section cut through the steps which lead down to the street (a detailed section sketch of the steps appears on page 91). The prism holder, when drawing that sketch, was primarily interested in representing the different components of the wall: brick, opus reticulatum, lava, and remaining patches of plaster (see sketch). A remark was added at the top of the drawing to point to the location in the notebook where the text that described that wall was entered. Such cross referencing facilitates CAD work by reducing the chance of confusion as to which descriptive text belongs to which sketches. A point from which all edges of the wall are visible. Firm and stable ground to mount the tripod on. Sometimes when it was not possible to find one place that satisfied both criteria, the crew was forced to set up at more than one location. First, the tripod is mounted by driving its three pointed legs firmly into the soil. Next, the total station is screwed into it. Then the machine has to be leveled. This is not a simple task. It involves two steps: the machine is lined up flush with two of the three leveling knobs, and one of those two knobs is adjusted to level position. Then the machine is rotated 90 degrees horizontally, and the third knob is adjusted to level position. This two-step leveling process rendered the machine level. Often however, after the completion of the second step, the bubble moves away from the center position for no clear reason to the surveyor. The process has to be repeated over until level position is reached. Finally, the data recorder is connected to the machine. This completes the hardware setup. This sample shows two consecutive points that are on the same vertical line (similar X and Y coordinates) and are 10 centimeters apart (the difference between the Z coordinates). The operator starts every new survey sequence with a new number that is a multiple of 100 or 1000. This makes it clear at which point a sequence of shots begins and ends. In the example of wall W51.39, the sequence of readings begins at point 1500; the last point recorded on that wall is 1562 (see sketch). The next sequence is started at point 2000, hence clearly distinguishing it as a separate sequence from that of wall W51.39. The final step in the setup is the resection. Resection refers to the task of calibrating the machine so that the new sequence of points would be translated and recorded as part of the global coordinate system of all the data points in the model. Resection requires shooting at two previously recorded points - datum points -from the new position of the machine (A discussion of datum points follows in the next paragraph). The computer in the machine compares the new readings to the old, and through trigonometric calculations, relocates the machine in virtual space so that all new points are stored relative to the global system. This calibration process is transparent to the user and takes a fraction of a second to complete. What are datum points: They are survey reference points selected in the beginning of every survey job. These points are assigned low numbers (between 1 and 99) to separate them from the daily-recorded points. They are also identified by letters. Datum points are carefully selected on the site on locations that will most likely last for several years. Typically, they are corners of marble steps, or notches on hard stone surfaces. The crew makes detailed sketches and descriptive notes in the notebook to pinpoint the location of these points in the forum. The survey of the wall followed the resection. The prism holder chose points on the wall, held the back of the prism towards them pointing the reflective surface towards the total station. The machine operator aimed at the center of the prism and fired. In a few seconds, the space coordinates of each point were stored in the data recorder. The prism holder marked the location of each point on the sketch and assigned it the same number as the one assigned by the data recorder (see sketch detail below). This was very important because during the construction of the CAD model, the numbers on the sketch were used as reference to make sense of the points brought in from the data recorder. In addition to recording the point numbers on the sketch, the prism holder added as many descriptive notes as were necessary for understanding the sketch and the numbers recorded on it. 1- The point desired was on a corner of a quoin hidden by plaster. The crew deduced the coordinates of that point by combining the x and y coordinates of a visible point on the same vertical line, and the z coordinate of a visible point at the same elevation. 2- The path line from the total station to the desired point was blocked by a stone or other large object. A gadget was devised to deal with this situation. This gadget consists of a clear plastic ruler marked in centimeters, with reflective tape pasted to its rear side. In previous seasons reflective tape was tested as an alternative to the prism and the results were satisfactory for the crew to use it as a substitute to the prism when necessary. Positioning the zero mark of the reflective ruler on the desired point and holding the ruler vertical allowed the machine operator to aim at a visible mark on the ruler. By subtracting the vertical distance between point zero and the point shot by the machine, the crew was able to deduce the desired point. 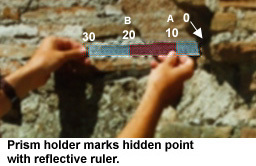 Another way to deduce a hidden point was by positioning the zero mark on that point and holding the ruler so that enough of its length was visible to the machine operator. The machine operator then shot two marked points on the ruler; the first (point A) measured 10 centimeters away from the desired point; the second (point B), 20 centimeters. On the CAD system, the crew was able to reconstruct that point by drawing a line connecting points A and B, and then extending the length of the line away from point A by ten centimeters. The extended end of the line marked the desired point (point "0" in the photograph). The reflective ruler had yet another important role. By fastening it to the top of an ordinary fishing pole, the crew was able to position it from the ground at the top of walls that would otherwise have required a ladder to reach. Using a ladder can be inconvenient and time consuming because it had to be moved every few feet when surveying a long wall. Using the fishing pole, the prism holder pointed the ruler at the desired point from the ground and the machine operator aimed at the ruler. In some cases when the prism holder couldn't locate the desired point from his position, the machine operator, using the telescope lens of the machine, aimed at that point on the wall first, and then guided the prism holder to place the ruler on the point. Once a point was shot by the total station and recorded by the data recorder, the machine operator added remarks in the comment column to describe it. These notes often duplicated the remarks taken by the prism holder in the notebook. This duplication was a good verification system during the construction of the model on CAD. This process of aiming at and recording points was repeated a few hundred times until enough points to construct the wall on CAD were gathered. Work ended at about 1:00p.m. The crew packed the equipment and headed back to the hotel. The crew gathered in the room that doubled as the CAD work-center. The first item on the agenda was equipment maintenance. Even though the disk space on the data recorder was fairly large, the bigger the data file being used became, the slower the machine responded in recording point information. It was necessary, therefore, to flush the contents of the data recorder every few days: the files stored on the data recorder were downloaded to the computer via the Winsurv software and a serial cable, then a copy was made of the active survey file (the one being used at the time) and given a new name (for example, the Macellum files were named mac-1, mac-2, etc.) All recorded points were deleted from this file except the datum points described earlier (see section on survey work). The trimmed down file "mac-2" was then uploaded back into the data recorder and used the following day. Then CAD work began. The first step was to download the data file created during the day from the data recorder into the computer. The data, which were transferred to the PC through the serial cable and Winsurv as described above, appeared in raw form--a format that contained information usable only by the software. A translation from that format to the Coordinate System format (.CRD) had to be performed before the data could be used by AutoCAD. This translation was also achieved using the software Winsurv. After the translation was complete, the data were ready to be exported to AutoCAD. The operator sent the data to AutoCAD in small batches of points rather than in one large cluster; this made the process of constructing the model less overwhelming. The notebook was very useful in making the selection of the batches because it contained information describing the points that defined the walls surveyed. The CAD operator selected the points and converted them to either DXF or script, the two export formats recognized by AutoCAD. In this example the operator used the DXF format. Then AutoCAD was invoked (because the operating system used at the site was Windows 3.1, the operator was able to run both AutoCAD and Winsurv concurrently and switch between the two). Once AutoCAD was started, the Macellum file which already existed and contained walls created in previous days, was brought up on the screen. The operator, who knew the location of the wall within the building, zoomed in on the approximate area of that wall, and through AutoCAD's file import utilities, inserted the DXF file. In Winsurv the content of the file was textual ( a list of numbers describing the X, Y and Z coordinates of each point). In AutoCAD, when the DXF file was inserted, its contents were automatically translated into points in three-dimensional space, each represented by an X symbol and a number that appeared below it; that was the same number generated by the data recorder and entered in the sketch book by the prism holder (see the section describing the work on the site). It was often the case that when a batch of points was inserted in the model, it was easily confused with all the existing lines and objects. Only through the notes taken during the surveying was the CAD operator able to effectively make use of the points. After the batch was inserted, the model construction process began. The operator used 3D-polylines to connect the points and to create the wire-frame model, relying heavily on the information recorded in the notebook. The term "wire-frame" meant that the wall in question was represented as a see-through skeleton. Creating the skin that covered the skeleton was achieved by attaching 3-D faces to the polylines (A 3D-face entity is an opaque polygon made of either 3 or 4 sides). The number of faces used to cover a wall was directly related to the level of detail that the wall was surveyed with. The more simplistic the surveying, the easier it was to represent it in CAD. Due to the importance of detail in the study of the forum of Pompeii, the surveying was done at a very high level of precision, and the building of the model was therefore no simple task and required careful planning before the 3D-faces were inserted. Once the points inserted were all used, they were erased from the model, and a new batch was brought in. The process of connecting the points with polylines, adding the 3D-faces, erasing the points and inserting a new batch was repeated several times until all the walls that were surveyed in the morning were modeled in the computer. The file created by Winsurv which contained the source for all the points was then given the date of the day as a name, and was archived in the storage disk along with files from previous days. This method of naming the files simplified the task of searching the archives when specific information was needed. The user scanned the notebook for the desired information, used the date that appeared at the top of the page as reference, and located the file that matched that date. Computer work ended when all the points were used in the model.